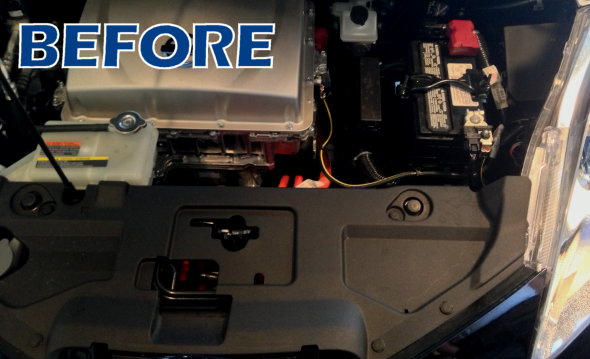 The EVEX-1000M and EVEX-1001M are do-it-yourself** wiring kits to provide emergency backup power from your Nissan Leaf. 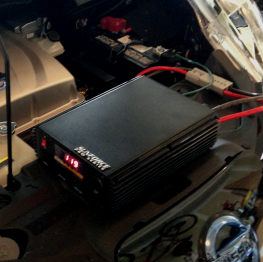 The kits are custom-designed for the Leaf (model years 2013-2017), to allow for a hidden installation with power connector access under the front hood of the vehicle. The kit includes a fuse holder with fuse, heavy duty wires cut to length with pre-installed wire terminals, and a heavy duty connector set to allow quick connections to the inverter of your choice as needed. The EVEX-1000M, is designed for a maximum continuous power of 1000W with 3000W surge. The EVEX-1001M is the same wiring kit bundled with a 1000W pure sinewave inverter. These power ratings are designed to work within the limits of the Leaf’s 12V power electronics design. "After hurricane Irma much of Puerto Rico went dark. Without power, there was no internet and all cell services grinded to a halt. Luckily, I was able to eek out enough bandwidth to discover EVExtend.com and immediately realized that my fully charged Leaf sitting in my driveway could easily power my fiber optic and basic necessities. I hurriedly fired off an email to Eric at EV Extend, and he sprung into action; within 48 hours we went from having no power to having a plentiful source of reliable energy conveniently in my driveway. Can't thank you enough!" Do you have kits available for continuous power greater than 1000W? I want to run a fridge or freezer off my vehicle, will this kit work? Will this void all or part of my vehicle's warranty? Do you have wiring kits available for other vehicles? At this time, we have chosen to only offer a wiring kit that supports up to 1000W continuous power. 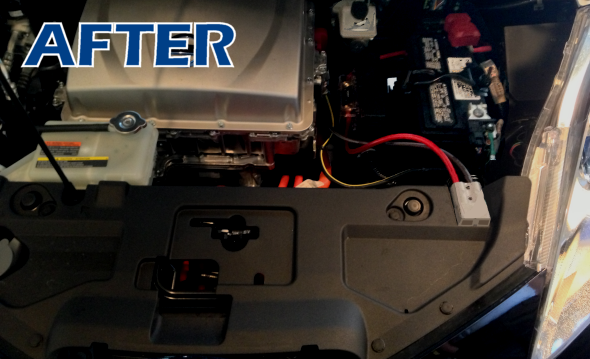 While the wiring of the kit we provide can handle 1500W, the 1000W limitation is to ensure that the power draw from the inverter will work properly with the built-in power electronics of the 2013-2017 Nissan Leaf. Larger systems, combined with other electronics that are always running in your vehicle, may draw more total power than the Leaf can provide, ultimately resulting in a dead battery or damaged electronics within your vehicle. While a 1500W inverter may be used to help start appliances with higher start-up surge power needs, usage should be monitored to ensure continuous loads do not exceed 1000W. The compressor of a refrigerator requires an initial starting current that is much greater than the current it will use once the compressor is running. Refrigerators are quite varied in size and energy efficiency, and as a result, this starting current (also known as "surge current" or "surge power") can vary greatly, even among similarly sized refrigerators. The ability for an inverter to provide this surge current can also vary greatly from product to product. As a result, it is often difficult to know definitively if an appliance can be operated from a given inverter without simply trying it. This kit has successfully powered a full-sized kitchen refrigerator having a nameplate rated current draw of 3.5 amps at 115VAC. The methodology to label the power consumption of the appliance, however, also varies greatly. This test was done using just a 1000W pure sine wave inverter, with a rated 2000W surge capability. As a general rule of thumb, people suggest measuring the continuous power of a fridge when the compressor is running, using a Kill-a-Watt power meter. An inverter that can continuously supply 3 to 4 times this measured power is typically sufficient to handle the initial starting current of the refrigerator's compressor. However, as stated above, the only real way to know is to simply try it with the inverter you plan to use. There have been various discussions and posts on forums about whether or not a wiring modification such as this would void all or part of your vehicle's warranty. The wiring kit only makes a connection to the Leaf's 12 volt battery terminals. As a result, it would seem reasonable to conclude that any warranty issues as a result of this installation, if any, would be limited to the 12 volt system. This would suggest that only a small portion of your warranty could be voided, and only if the dealer can show it was this wiring kit that caused the need for repairs. However, EV Extend cannot make any definitive claims as to whether or not installing this kit will void your warranty. We also have a kit available for the Gen 1 Chevrolet Volt and Gen 2 Chevrolet Volt, and hope to have kits available for other popular hybrid and plug-in vehicles soon, including the Chevrolet Bolt EV. If you would like to be notified of when a particular vehicle has a kit available, please contact us.